JCI - What happens to ΔF508 in vivo? What happens to ΔF508 in vivo? Citation Information: J Clin Invest. 1999;103(10):1369-1370. https://doi.org/10.1172/JCI7119. Under heterologous cell culture conditions (top), only wild-type (WT) CFTR shows cAMP-stimulated channel activity. Only when manipulated to induce trafficking to the membrane (top right) does ΔF508 show any detectable channel activity. Tissue-specific differences in CFTR localization described by Kälin et al. are seen between epithelia of the sweat gland and epithelia of the airway and intestines (bottom). 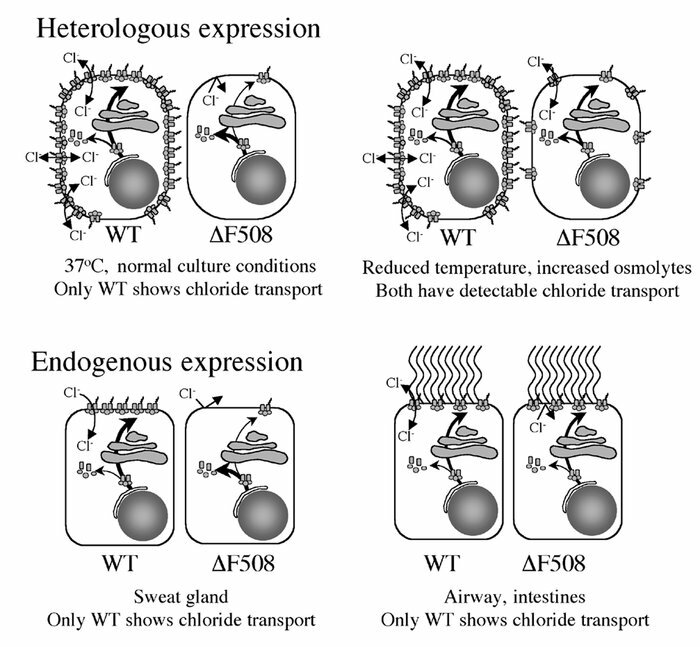 Whereas ΔF508 in the membrane of transfected cells responds to cAMP (top right), ΔF508 in endogenously expressing airway and intestinal cells (bottom right) does not.